Diablo Canyon Nuclear Facility is DANGEROUS and must be SHUT DOWN! 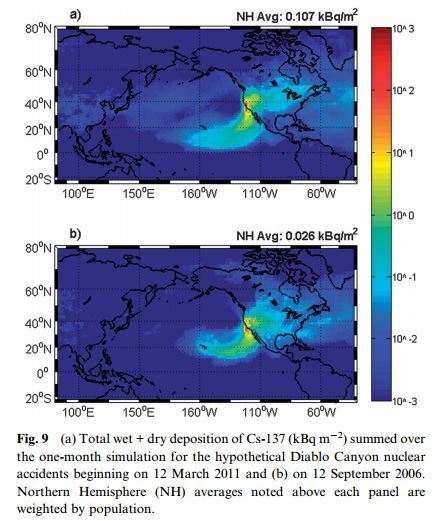 The following were extracted from this research paper, relating to a hypotethical accident at Diablo Canyon Nuclear Station similar to that at Fukushima. Diablo Canyon nuclear facility is near many earthquake faults, both onshore and offshore. The smoking gun... Shoreline Fault is within 600M of power block! All nuclear facilities are inherently dangerous because they must be actively cooled even when in "cold shutdown". Nuclear facilities such as Diablo generate millions of pounds of toxic radioactive waste which must be safely stored for up to 140,000 years before it is safe, or about 4000 generations. Running these power stations without a means to safely convert the waste is IMPRUDENT and UNREASONABLE. Our elected officials should not stand for this! The "Diablo Canyon" nuclear facility is very near a number of earthquake faults, most particularly, the Hosgri fault and Shoreline fault. If you had to choose the worst place to build such a facility on the coast of California, this might be it. If an earthquake occurs, the vibrations may cause any number of failures and may result in total meltdowns. Just like the Fukushima Daiichi, the Diablo Canyon nuclear facility is right on the coastline, and is subject to tsunami inundation. This was actually what caused the failure of the cooling pumps at Fukushima. The Diablo Canyon nuclear facility uses "once-through" cooling, which kills virtually all animal life in the extracted ocean water, and then the higher temperatures kill life near the exit conduits. Nuclear power is a bad deal for consumers, costing about 166% of market rates. Nuclear power is not needed in California which already has about 156% of energy requirements, so losing 10% will not affect us much. The San Onofre nuclear facility was closed in 2012 and there were no significant problems after minor adjustments were made. BOTTOM LINE is that we will be better off with Diablo Canyon closed, and the sooner the better. 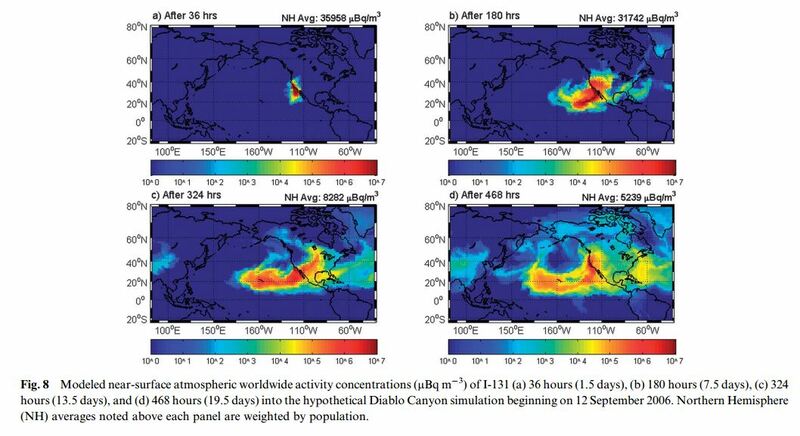 Fukushima radioactive plume superimposed over Diablo Canyon. DO YOU LIVE NEAR GROUND ZERO? please note that the impact of Fukushima was reduced substantially because prevailing winds blew the radioactive plume off-shore. 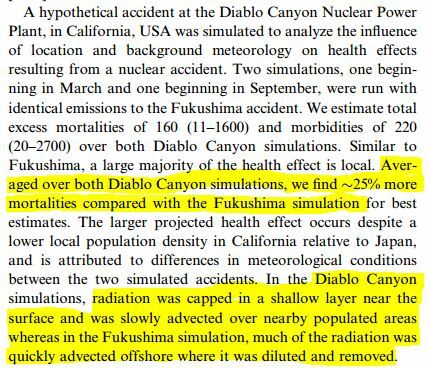 Diablo Canyon would be much more devastating because winds blow on-shore and temperature inversions keep the radiation near populated areas. Researchers estimate ~25% more mortalities in California. 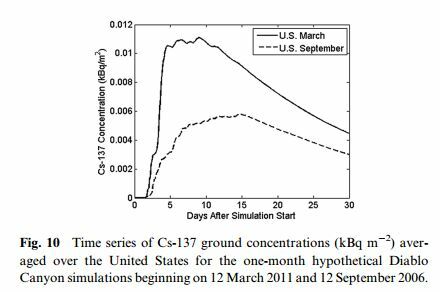 Iodine 131 dispersion after hypothetical Fukushima-like accident at Diablo Canyon (in Sept). 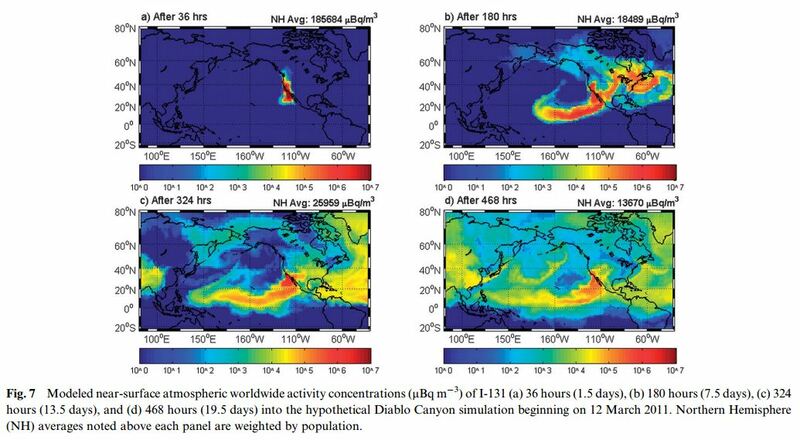 Again, the entire California coast is exposed to radiation in the first 36 hours. The shoreline fault, just yards from the plant has been recently discovered and is now being researched. This diagram shows the network of faults near the DCPP nuclear facility, highlighted. jpg FaultsNearDCPP2.jpg manage 84 K 2014-07-15 - 17:26 Raymond Lutz This diagram shows the network of faults near the DCPP nuclear facility, highlighted.